pull the talus forward relative to the tibia. This faulty ankle joint positioning limits DROM. standing. To evaluate dynamic muscle reaction time to simulated ankle sprains, Dr.
need to approach this “homogenous” injured population differently for treatment. of physical activity of at least 90 min/week in the past 3 months. previous ankle injury and a normal score (100%) on both FAAM ADL and FAAM Sports. score of ≤ 90% on the FAAM ADL, and (iii) a score of ≤ 75% on the FAAM Sports. trapdoors can be triggered to fall to 30 degrees of inversion when stepped on (Fig. 1). 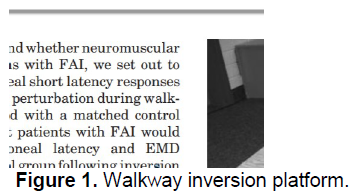 trials (seven for each leg) of stimulated inversion during walking. maximus, and gluteus medius based on SENIAM EMG guidelines. used to calculate joint kinematics. collection is now complete, but additional time is needed for analysis and interpretation. 1. Baumhauer JF, Alosa DM, Renstrom AF, et al. Am J Sports Med. 2. Hertel J. Sports Med. 2000;29(5):361-371. 3. Verhagen RA, de Keizer G, van Dijk CN. Arch Orthop Trauma Surg. 5. Konradsen L, Magnusson P. Knee Surg Sports Traumatol Arthrosc. 6. Mitchell A, Dyson R, Hale T, et al. Med Sci Sports Exerc. 2008;40(8):1515-1521. 7. Vaes P, Van Gheluwe B, Duquet W. J Orthop Sports Phys Ther. 8. Wikstrom EA, Hubbard TJ. Arch Phys Med Rehabil. 2010;91(8):1267-1271. 10. Pope R, Herbert R, Kirwan J. Aust J Physiother. 1998;44(3):165-172.